Conditions in Venezuela are very serious, and the country is experiencing a man-made humanitarian catastrophe. Over a million and half people have fled the country in the last few years. The crisis there has the potential to destabilize Venezuela’s neighbors, but that is no reason to contemplate military intervention. It is ludicrous to describe Venezuela as a threat to the United States. None of Venezuela’s neighbors wants U.S. intervention, no regional government would support it if the U.S. attacked, and attacking Venezuela would only exacerbate the country’s severe economic and political problems. The U.S. would be condemned by most of our neighbors for waging an unnecessary war, and our military would find itself bogged down in another thankless mission of policing a country where the presence of our soldiers would be deeply resented. As usual, Rubio is completely wrong. All have close ties to Rubio, who’s playing a central role in setting U.S. policy in Latin America as chair of the Senate’s Subcommittee on the Western Hemisphere. 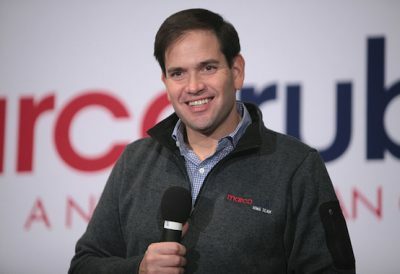 Rubio has a close relationship with Bolton and Secretary of State Mike Pompeo, who successfully pushed for tougher Venezuela sanctions Rubio had been calling for — including penalties that target a Venezuelan official implicated in an assassination plot against the senator. The Trump White House is likely to be receptive to Rubio’s horrible ideas, and we know that the president’s first instinct was to consider military intervention. Congress and the public need to make it known now that they reject an attack on Venezuela, and Congress needs to make clear that the president has no authority to start a war against the Venezuelan government on his own. Featured image is from Gage Skidmore/Flickr.